But the neighbor's fireworks scared them off. T​he Mutts have exceptionally poor communications skills. This morning, as I was making my roast beef sandwich for lunch, Gus and JoJo both came over to me. One sat on each side, and both stared up at me. Clearly, they wanted something. But WHAT? I asked. They both just sat there, stock still. I asked again. No response. I offered them each a bite of roast beef. They accepted this with alacrity, but neither would tell me what it was they came for. So I tried again. Again they snapped up the roast beef. Again they clammed up on the question. We went through the same routine a third time. Same result. I'm nobody's fool, and I know when a trick isn't working. So I finished making my sandwich, put it in my lunch bag, and strolled off. Whatever those dogs wanted, I'll never know. I only hope they're as disappointed as I am. When we first got JoJo, we started noticing that paper of any sort was no longer safe withing dog range. Since Gus had never shown any proclivity for chewing our belongings, we naturally assumed that the newcomer was responsible. After months of trying to discourage this activity, we bit the bullet and got JoJo a crate. At last, our stuff was safe. For about a year our stuff was, in fact, safe. Then we started coming home and finding our books, magazines and newspapers shredded again. Just like the old days. But JoJo was in the crate. And unless JoJo was letting herself out of the crate and getting back before we got home, the culprit had to be Gus. Maybe he'd been setting her up the whole time. Or maybe Gus was acting in solidarity, protesting to get JoJo freed. Since keeping her in jail wasn't preventing crime, and the crate took up a lot of room, we set JoJo free. We've pretty much gone back to shredding our own paper. Sometime the tail-hole gets a little overchewed. We're not going to re-incarcerate her. Just got to remember to keep the bedroom door shut when nobody's around. My many loyal reader will recall that a few weeks ago I reviewed Linda Johnston's Double Dog Dare, and said some nice things about it. I no longer have a copy of that book. Yesterday, while I was out, JoJo took it upon herself to shred Double Dog Dare and The Gangs of New York by Herbert Asbury. Both of these books were on end tables well out of JoJo's reach, so I'm at a loss to explain how she got to them. There were also several books on the floor that she could have got to easily, but they weren't touched. I can only conclude that she selected these two books on purpose, and may have enlisted Gus to get them for her. Gus himself never shreds anything but his own leg and the occasional tennis ball. I wonder: does JoJo's selection of these two books constitute a favorable review or an unfavorable review? Late-breaking News: JoJo only destroyed half of Double Dog Dare yesterday. The rest she hid on the deck, where it got rained on. She brought it back in to complete the job today. What a thoughtful little pooch. I've been a bit lax about keeping folks up to date on the status of JoJo and Dinghy. Gus no longer tries to kill JoJo, and has in fact become rather protective of her. They play together for hours, as illustrated at left. This looks, I'll admit, like Gus trying to kill JoJo, but please note that her teeth are every bit as much engaged as his. In fact, she usually starts this nonsense. Best evidence that he's not actually trying to kill her is that, at some point during each of these fights, he'll roll onto his back and let her drag him around the room by his ruff. How a 25-pound dog drags a 60-pound dog eludes me, but she does it. Dinghy is no longer the starved urchin he was when Betsy got him. He's about as tall and as long as JoJo, but his legs and body are twice as thick and his paws are bigger than Gus's (no big accomplishment, this: Gus looks like he's walking in toe shoes; nevertheless...). The vet's current estimate is that he's part beagle and part pit bull, and will end up at about 60 pounds. He's also a real sweetie pie. Besides at my house, that is. USA Today had a story on August 18 called "Mutt-i-grees Club: Where mongrel is the new pedigree". Mutt-i-grees Club is a project of the Pet Savers Foundation. My big sister sent me this story, which pretty much proves that those stories that my whole family hates me are exaggerated. New material coming soon. Honest. My good friend Andrea called my attention to this article in TIME. "In Dog We Trust" is about Barack Obama's biggest post-election decision: what kind of dog to get. Although I try not to let my politics intrude on this blog, I would like to weigh in on the side of mutts in this matter. As Americans, we're pretty much all mutts. No matter how far back you can trace your family in this country, it's a sure bet that there's more than one name Auntie Macassar quietly pruned from the family tree. And that you're swimming in a bigger gene pool than you know. Hybrid vigor's what America's all about. Helping the least fortunate among us is what we do, at any rate when nobody's trying to scare us into cowering in our basements with the family silver. So come on, Barack, get a shelter dog, the more undefinable, the better. Correction: In my story on Bruno a while back, I mistakenly identified him as an American Bulldog. I'm now informed that he's an Old English Bulldog. This, it turns out, is an example of what I'm talking about above: nothing about Bruno's dress, behavior or speech indicated that he was foreign-born, and I'm proud to say that I just took him for one of us. In a larger sense, we're all one of us. No word on whether Bruno's a Naturalized American Bulldog. We get a new dog. Gus, um, thrilled. In the surest sign yet that the End Times are upon us, my Lovely and Charming wife developed Puppy Fever a couple weeks ago after Betsy adopted Dinghy. [Update: the vets now think Dinghy's going to grow up to be between 50 and 70 pounds; good thing the Schnauzers are nice to him.] So we went to Petfinder, and found JoJo, a beagle mixed with some kind of hound, at PAWS New England. We applied, were accepted, and on Saturday, July 19, we went to Plainfield, Connecticut to pick her up, with her medical history and health certificates. We weren't alone. There were about 150 dogs on the truck [from Alpha Dog Transport], and all but a handful had families waiting for them. I tried to document as much of it as I could. If you had a dog on that truck and I didn't get a picture, please send me one and I'll put it in the Photo Album. Late-Breaking News: Gus, to no one's great surprise, keeps sitting in the corner trying to will JoJo into disappearing. I'll keep you posted on how that works out. JoJo, to her credit, isn't taking any crap off him. Scotty delivers boats. One of his boat deliveries took him to a yard in Lumberton, North Carolina, where he was greeted by six starving puppies,part beagle, part mystery, apparently abandoned there. He called our friend Betsy, and asked if she'd like one. "Sure," was the answer. "How do I know which one?" Scotty asked. "Just say 'Who wants Betsy for a mama?'" So Scotty said "Who wants Betsy for a mama?" and one puppy, who evidently thought he said "Who wants to vote for Obama?" ran forward. So he scooped that one, reported the rest to the local shelter, and drove Capeward. In honor of his nautical heritage, the pup was named Dinghy. He had fleas, mange and a swollen belly due to malnutrition. He's been home about a week now, and is flealess, his mange subsiding, and his belly back to normal. And he's been adopted as well by Betsy's two miniature Schnauzers, Molly and Max. Turns out, dogs like meat. I'd have thought they were more corn-fed, but folks tell me this is not the case. Mickey liked meat. In his mad, impetuous youth, he could jump onto the kitchen table from a standing start. Jump, actually, suggests too abrupt and effortful a movement. He'd just sort of flow from the floor to the table, like a seal rising in the water. He did this once on Thanksgiving. Ate the whole turkey. That's actually all I remember of that Thanksgiving. I guess we ate something, but I have no idea what. My friend Sue Nommy, from down at the credit union, tells me that once, her family had some steaks sitting on the counter and went off to do some important meal-preparation tasks out at the grill. When they came to fetch the steaks, there were no steaks. There were, however, sitting on the floor next to the counter where the steaks had been, the family's German Shepherd and two Dachshunds, looking like they had no idea where the steaks had gone and by the way can we please have some more? Sue also tells of her brother's Dalmatian, named Harlequin and called Harley. Harley wandered off the reservation one day, and Sue's brother and his wife went out in the car to look for him. Up one street and down another, they called Harley's name. Finally, near home again, Harley appeared. With a two-inch thick steak the size of a hub cap in his mouth. Not quite cooked through, but with that unmistakable I've-been-heisted-off-the-grill look about it. They hustled Harley into the car and drove home. My favorite part of the story is that the family took Harley and the steak home, cut off the part that had been in Harley's mouth and gave it to him, and dined on the remainder for a couple of days. This certainly would have been my inclination, but other members of the family are more squeamish. I salute the ingenuity and resourcefulness of the American people in finding a proper use for this dog-given sustinence. Gus, although in all other ways flawless, chews on himself. This has been the subject of previous reports. Recently, our efforts to keep Gus from self-amputating have included a number of medications which, individually or in combination have made him violently flatulent. We're talking more silent and more deadly than phosgene, but vastly more malodorous. Dahlin' Daughta has taken to calling the unfortunate pup "squeakycheeks". My kid sister (she's now a full professor at a real university; who knew?) has a little doggy that's part Border Collie and part helicopter. Dog's name is Fash. 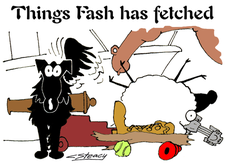 It's pronounced Fosh, and the name is an Irish word for trouble. Since the sister and the dog live in Ireland, this makes a certain amount of sense. Fash plays fetch with more energy than I've ever seen in a dog. When I met her nine years ago, you could throw a stick up a 60-degree slope and Fash would run up and get it, over and over again, until my sister would intervene and tell me to cut that crap out. Dahlin' Daughta was just over there for a visit, and she reports that at the age of 14, when most dogs are retired and have taken up needlepoint, Fash still routinely digs out under the back fence and roams the town, and she'll still play fetch till your arm falls off. Sometimes I want to grow up to be Fash, so I'll have that kind of energy at that age. Sometimes I think I DID grow up to be Fash, since I always seem to be fetching some damn thing for somebody. I've mentioned Mickey a few times without explaining who he was. 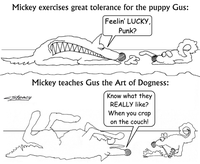 Mickey was Gus's predecessor and, though I won't say it where Gus might hear, a much better dog. Mickey was a Cape Cod Retriever, which is a Black Lab mixed with whatever happened to be walking by that day. In Mickey's case, that was a German Shepherd, and he looked just like you'd expect a Black Lab/German Shepherd mix to look. In his early years, Mickey ate a couch, a lamp, and several window screens. His whole life, although he was officially not allowed on the couch, whenever we came home we'd find the still-warm impression of Mickey there (please note: I never said he was the best-BEHAVED dog), but he was extremely tolerant of our kids. In spite of several years of poking and prodding, the only time he ever nipped at The Wee Lad was once when that party stepped on his stomach. Heck, I'VE bit the kid more often than that. When The Dahlin' Daughta was a baby, she could crawl on Mickey for hours, and when he'd had enough, he'd lick her face a few times and she'd take off. He was also highly tolerant of other dogs, something his successor will probably never be. When our neighbors' dog Emma (the same mix, who looked like Mickey's twin) needed to be taken off their hands for a few months, she moved in seamlessly. The only real problem was figuring out which dog we had to give back. When Gus joined us, Mickey took the pup under his tutelage and taught him everyting he needed to know to be a worthy successor. Gus, of course, didn't learn a damn thing. Except maybe how to chase cats and the UPS guy. When he was 12, Mickey developed arthritis and over the next couple of years found that he could no longer climb stairs, get up on the couch, or finally, go outside without assistance. A few months before he died, I broke my foot while carrying him out for a pee. Fell down with him in my arms, which literally scared the crap out of him. We finally had to let him go when he was 14. He could no longer stand up by himself, couldn't stand to pee even when I held him up, and stopped eating. The day after Thanksgiving, 2003, we took him to the vet and had him euthanised. He's buried out back, with a dogwood tree over him to mark the spot. Designer Mutts are intentional mixed breeds that some folks want to believe are breeds. Being a fan of mutts, I'm hesitant to endorse this trend. It suggests that plain old mutts aren't good enough, which they are. It also suggests that the decades of effort traditional breeders have put in are easily duplicated and that the whole breed thing is a bit of a farce. I'm not going to comment on that. The best known Designer Mutt is the Labradoodle, but there are apparently no limits to what somebody will cross with what. Or what they'll call it. The Labradoodle is a designer mutt, a mix of Labrador Retriever and Standard Poodle (no link yet; give me time). The mix originated as a service dog in Australia, intended to combine the docility and trainability of a Lab with the hypoallergenic and low-shedding coat of a poodle. This mix worked well, and Labradoodles are often used as guide, assistance and therapy dogs. If that were the end of it, I wouldn't bother to mention it. But some Labradoodle proponents insist that it's a breed. And many old guard purebred fans insist just a loudly that it's not. 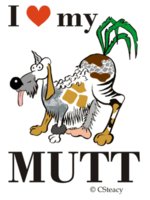 As a fan and supporter of mutts, I'm inclined not to care, but the recent appearance of other designer mutts, like the Schnoodle, Goldendoodle, Cockapoo, Yorkipoo, Puggle and Maltipoo (this sounds like something I'd take the dog to the vet for) makes me want to nip this thing in the bud. Unless, of course, I get to register Gus as an Elkhound of Indeterminate Ethnicity. A mutt is any dog of mixed breed, including mixes of two known breeds, mixes of one known breed and who-knows-what, and mixes of who-knows-what and who-knows-what. Owners of and propagandists for purebred dogs tend to disdain mutts, saying they combine the less desirable traits of whatever breeds they're made of into one bad dog. Those who love mutts like to point out that they seldom carry recessive traits that may be inbred in purebred dogs, like hip dysplasia or a tendency to appear in LL Bean catalogues. Gus, my dog and the logo-model for this site, is a mutt. He's part Norwegian Elkhound and part we-don't-know. His predecessor, Mickey, was a Cape Cod Retriever, which is a mix of Black Labrador Retriever and whatever was walking by that day. Mickey also had German Shepherd in him.